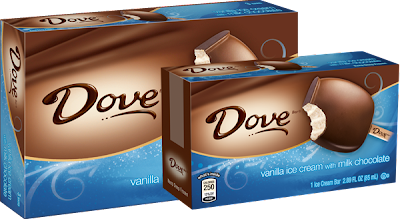 Way back when dove sponsored a national ice cream month post, they also included 3 of their tasty dove bars for me to try. For months and months I've stared at these things wondering what flavors could be inside, and on this fine Fall day, it's time to find out. Here are our three samples.... oh I wish they were labeled so I knew which was which. So, I've decided to unwrap all three at the same time and share them with my family. Let's see who's going to get what. Hmmm, still can't tell what's what, but they smell wonderful. DOH! I've been duped! They're all the same! 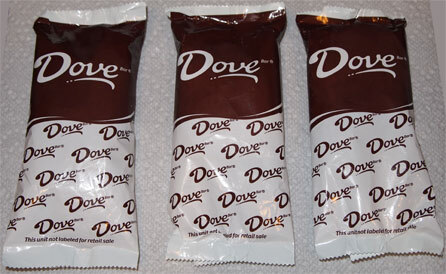 There are currently six flavors on the market (including the mint dove bar I reviewed last year), yet for some reason they sent three of the same flavor. I'm starting to to wonder if the box didn't fit in the packing container and so they just ditched the box and left the bars. Don't get me wrong, I still appreciate the free treats, I'm just a little confused as to why they wouldn't want me to show off more than one flavor. Oh well, let's proceed. Now before I've even finished my first bite of tasty chocolate coating, my daughter goes "the ice cream isn't very flavorful". I jumped to correct her that Dove bars are all about their fancy Dove chocolate coating, but at the same time, she's right. 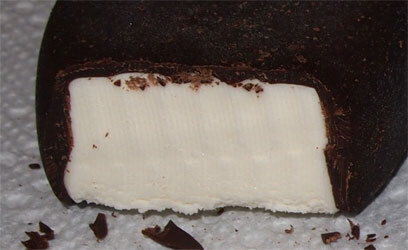 The ice cream inside, while it does have a fine texture for a treat, isn't particularly flavorful. There's just no potent vanilla flavor let alone any kind of vanilla bean flecks floating about. I think that we'll all still be attracted to buying these bars, but I think the lackluster internal flavor leads to a deceleration in the repetition of our purchases.... ok, way too many big words there. The point is these are good, but they keep themselves from being great. You posted about it being a fine October day. Umm Dubba, it's November ;) (had to tease ya!) Love how you have the little one already becoming an ice cream taste tester! DOH! wrote the review last weekend! and yup, she's great, she tries most of the stuff on the blog, she's a trooper! Your daughter is adorable; a little ice cream blogger in the making! Could u try the Dove bars again. I've been a fan of them for years... until just recently. The ice cream inside now has an AWEFUL aftertaste. I used to love these treats & now they're disgusting. I don't know if they changed the recipe or they're having issues at the factory, but it's ruined them. I've tried many boxes from many stores & they're all the same nasty ice cream. It's like they added too much sugar, or other random sweetener. Dove (Mars) went to light ice cream on their candy flavored ice cream pints, so it wouldnt surprise me if they've lost hope and done the same thing here. I'll keep my eyes open but it feels like eventually they are just going to give up all together and stop making frozen treats. Bummer. I was hoping that it was just a fluke & that they'd say something on the box if they changed the type of ice cream. But it wouldn't surprise me if they changed it without saying anything. well it would say "light ice cream" on it, or it could be a partial tweak, I won't know til I find them again. that said, don't lose hope. Haagen-Daz, Blue Bunny, and Talenti gelato all make excellent bars. 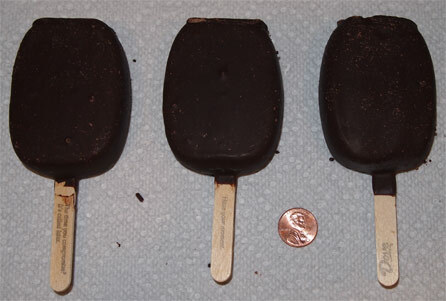 Well, magnum can be great too, it just depends how much caloric and fat intake you are willing to handle.